The Serenade for Wind Instruments, Cello, and Double-Bass in D minor (Serenáda pro dechové nástroje d moll), often catalogued as Op. 44 (or B. 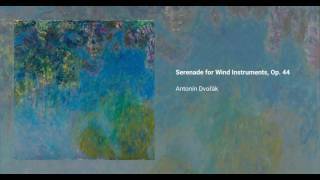 77) is a chamber work by Antonin Dvorak, both written and premiered in 1787. The piece evokes slavonic styles, and calls for two oboes, two clarinets, two bassoons, and three horns. Cello and double bass parts were later added to enhance the bass part.